Many users find that using an external keyboard with keyboard shortcuts for PowerPoint Online on Windows helps them work more efficiently. For users with mobility or vision disabilities, keyboard shortcuts can be easier than using the touchscreen and are an essential alternative to using a mouse. This article itemizes the keyboard shortcuts for PowerPoint Online on Windows. The following table provides the shortcuts that you'll likely use often in PowerPoint Online. With the focus in the thumbnail pane, press Ctrl+M. Delete selected text, object, or slide. PowerPoint Online runs in your web browser, so it doesn't use access keys such as those used in PowerPoint for the desktop. For example, pressing Alt moves the focus to the browser menu bar and familiar shortcuts, like Ctrl+P (Print) and F1 (Help), run browser commands rather than PowerPoint Online commands. To move the focus to different parts of the PowerPoint Online interface (from the ribbon to the thumbnail pane, for example), press Ctrl+F6 to move forward or press Ctrl+Shift+F6 to move backward, and to move in and out of the content of a slide. To navigate commands in PowerPoint Online, press the Tab key to move forward, press Shift+Tab to move backward, and press Enter to select. Tip: To quickly give a command while in Editing view, move the focus to the Tell Me box by pressing Alt+Q and then typing the command you want. To select a command, press the Up Arrow key or Down Arrow key, and then press Enter. In Reading View, a horizontal list of commands is at the top of the screen above the document. Press the Tab key until the row of commands has the focus, and then, to move through the commands, press the Tab key. To select a command, press Enter. To switch to Editing View, move to the Edit Presentation command, press Enter, and then select Edit in PowerPoint Online. 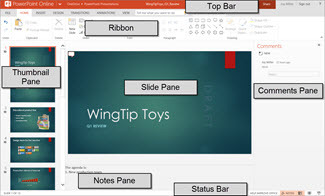 In Editing View, the ribbon is the strip at the top of the PowerPoint Online window. The ribbon is organized by tabs. Each tab displays a different set of tools and functions, made up of groups, and each group includes one or more commands. To use the ribbon, repeatedly press Ctrl+F6 until the ribbon has the focus. To move between tabs, press the Tab key or Shift+Tab. To access the ribbon for the currently selected tab, press Enter. To move between commands on the ribbon, press the Tab key or Shift+Tab. If the selected command is a button or split button, press the Spacebar to activate it. If the selected command is a list (such as the Font list), to open the list, press the Down Arrow key. Then, to move between items, press the Up Arrow key or Down Arrow key. When the item you want is selected, press Enter. If the selected command is a gallery, press the Tab key to go to the More command for the gallery and then, to open the gallery, press Enter. Press the Tab key to move through the items, and press Enter to select one. Move from the slide pane, Comments pane, Notes pane, status bar, title bar, ribbon, and thumbnail pane. Move in reverse order, from the slide pane, thumbnail pane, ribbon, title bar, status bar, Notes pane, and Comments pane. Go to a different ribbon tab. Carry out the currently selected ribbon command. Move between groups of features on the ribbon. Create new slide after currently selected thumbnail. Move left to right through placeholders on a slide. Select or edit the current placeholder. End editing text in a placeholder. Select all objects on the page. Move to the beginning of a placeholder or notes. Move to the end of a placeholder or notes. Select to the beginning of a paragraph. Select to the end of a paragraph. Select to the beginning of a placeholder or notes. Select to the end of a placeholder or notes. Select all within the placeholder or notes. PowerPoint Online saves changes automatically. Paste cut or copied text. Nudge the shape to the right. Nudge the shape to the left. Send the shape to the back. Send the shape to the front. Except for the "add a new comment" shortcut, the Comments keyboard shortcuts listed below work only when the Comments pane is current and in focus.